There are two reasons why it is difficult to comment on the legacy of a finance minister. 1) It is a tremendously challenging job, anywhere, any time. Stewarding one of the largest economies in the world through a global economic crisis is no cakewalk, and it has clearly taken a toll on Jim Flaherty. (Canada has fallen fromÂ 8thÂ toÂ 11th largestÂ economy since 2006.) Critiquing this performance, when so many factors are beyond an individualâ€™s control, and so much soul-searching takes place behind the scenes, is neither easy nor lovely. 2) Where does a prime minister end and a finance minister begin? There is little sunshine between these two positions in any administration, all the more so with the Stephen Harper administration. Nobody is confused about who is boss. So are we judging Mr. Flahertyâ€™s legacy, or Mr. Harperâ€™s? Still, Mr. Flahertyâ€™s departure is a good time to trace his eight-year contribution to Canadaâ€™s fiscal history. Here is a contrarian view on four widely touted accomplishments, and two major developments that have received little notice in the round-up of opinion on the Flaherty legacy. So much of what happened under Mr. Flahertyâ€™s watch can be attributed to global phenomena, both good and bad. Itâ€™s a big stretch to describe Mr. Flahertyâ€™s hand on the tiller as the reason Canada fared relatively well through the global economic crisis. Canadaâ€™s economy was a major beneficiary ofÂ double-digit growth in China, which continued to 2010, propelling our resource sectors as manufacturing took a beating. Thatâ€™s why our economy rebounded so sharply in mid-2009. Mr. Flaherty was hailed for showing bravery by disciplining mortgage markets four times. But people forget it was none other than his office that gave the green light on zero-down 40-year mortgagesÂ in 2006, the ruinous public policy that underlay the housing crisis in the United States and greatly expanded the roles of mortgage insurers such as AIG and Genworth in Canada. As rising household indebtedness â€“ driven primarily by the rush into home ownership â€“ became the No. 1 domestic economic risk, the feds had little choice but to reverse course. Mr. Flaherty was saluted for showing an open mind and reversing his position on stimulus. Really? It would have been nothing short of fiscally recklessÂ notÂ to do so in January, 2009 (after insisting no deficit would occur, and no action was needed, in November, 2008). Governments around the world were trying to put a floor under a global economic crisis that had no equivalent since the 1930s. No one knew where the bottom would be. Even so, it took the unusual step ofÂ proroguing ParliamentÂ in the midst of the crisis for the feds to get their act together. Mr. Flaherty is widely praised for fiscal stewardship and balancing budgets. Anyone can balance a budget. How you do it is whatâ€™s important. Not one tax cut was delayed or postponed during the crisis. The â€œrevolutionaryâ€ Tax Free Savings Account was actually introduced in the eye of the economic storm, January, 2009, a time when what was desperately needed was more spending power, not less. A flurry of boutique tax cuts in subsequent budgets addedÂ 383 new tax loopholes. 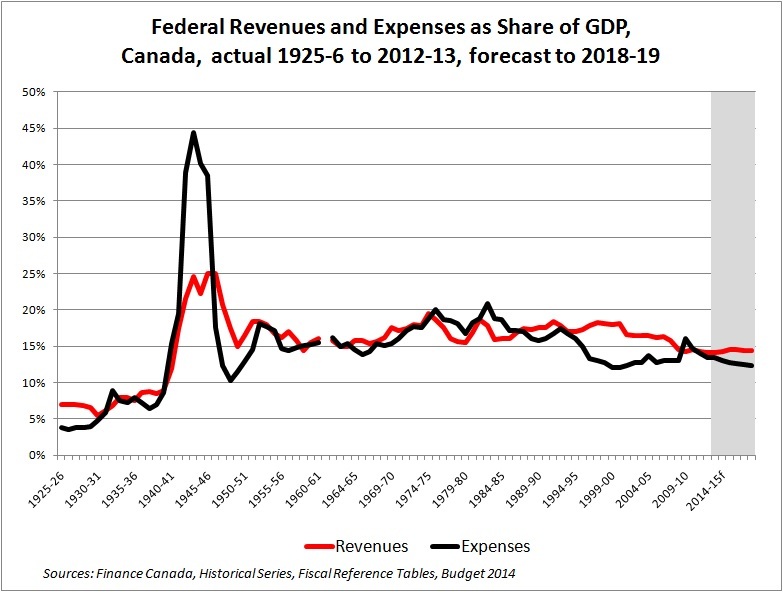 To balance the books, direct federal program spending was deeply cut (fewer statisticsÂ andÂ the end to many archives; massive staffÂ cuts in monitoring tax evasion and fraudÂ at Canada Revenue Agency;Â less food safety inspection;Â inadequate rail oversight; the list goes on). These cuts will deliver a surplus by 2015 (or before), just in time for a federal election. This is a political, not fiscal, imperative. It should score no points among those looking for sound public finance decisions. The costly rush toward a balanced budget will permit the Conservatives to make good on election promises made in 2011, ushering in billions of dollars more in tax cuts (income splitting for families with childrenÂ anddoubling contribution limits to Tax Free Savings Accounts) that have been shown byÂ the Finance DepartmentÂ itself to provideÂ more benefit to the richthan everyone else. Income inequality is the one thing you donâ€™t want to make worse. It slows development (says theÂ World Bank), drags economic growth (International Monetary Fund), is the â€œultimate social time bomb,â€ (Organization for Economic Co-operation and Development)Â and can lead to undeveloped potential and political instability even in nations such as Canada (Conference Board of Canada). Electoral promises that are known to worsen inequality do not show good fiscal or political judgment, which is perhaps why Mr. FlahertyÂ twitched over the income-splitting proposalÂ at the end of his tenure. Mr. Flaherty has presided over one of the most startling periods ofbalkanization of our fiscal federation. Itâ€™s all the more startling since his home province of Ontario, the nationâ€™s most populous, has been hit hard by almost every unilateral decision: A rejigging of equalization payments in a manner that pits province against province; defining how training dollars should be spent; promising but not spending money for municipal infrastructure and affordable housing; ending the 10-year Health Accord later this month. This is also the first recession since the Second World War in which the provinces have doneÂ more of the heavy liftingÂ than the feds, and one whose aftermath deliberately steers us to the smallest federal presence in the economy since the late 1940s. Is this legacy pragmatic? Prudent? Steady-handed? More like ideological, frequently reckless, and just plain lucky. But even as someone not persuaded by Mr. Flahertyâ€™s policies or politics, I rue the loss of his presence at the cabinet table. The arc of his eight-year tenure as Canadaâ€™s Finance Minister began with a certain fiscal swagger, but ends with what appears to be more sombre and thoughtful humility. Thatâ€™s exactly what Canada needs today. The G8/20 fiasco in Toronto/Muskoka was the worst moment in int macro policy making in years. France and the UK had agreed to bring in a bank tax, Canada worked to scuttle it and did, Harper taking the credit. In 2010 Canada led the charge to introduce austerity, now that the recovery was in hand (! ), the disaster show is still running. The next instalment is in Ukraine. In defence of Flaherty, he was only as bad in his own way as the other two main finance guys Wilson, Martin Canada has had running things badly since 1984. As Jim Flaherty exits the Finance portfolio, he leaves 1.3 million Canadians unemployed, income inequality growing, and an economy that is stagnant. Because of cuts to inspections and regulatory budgets, public safety has been threatened. Vital science has been terminated and vital statistics no longer collected. Veterans feel abandoned. But not all have suffered. Big oil companies, big banks and big corporations have been beneficiaries of government largesse through either corporate tax cuts or direct bailouts. What are the prospects for fiscal policies that actually serve the majority of Canadians and not just the elites? Since newly-designated Finance Minister Joe Oliver was formerly chief executive of the Investment Dealers Association of Canada, a lobby group and self-regulating body for the securities industry, Canadians can unfortunately expect business as usual. Recently a group of progressive economists spoke out against current federal government austerity policies. If you wish to support them, go to the on-line public petition. The link is http://chn.ge/1fJAraF. Thanks! Thank you Thank you Thank you for this piece. The cheerleading for our esteemed Finance Minister in the corporate media is both strangely decontextualized and theological in its intensity. As you point out, the TFSA was introduced on his watch. That’s a much better record than other finance ministers (say Allan MacEachen) could point to, so you might consider cutting him a little slack. Re: History will judge Flaherty kindly, March 19. History may look less kindly on Jim Flaherty’s legacy than columnist William Watson supposes. Flaherty’s fixation with balancing the budget has kept 1.3 million Canadians involuntarily unemployed, costs our economy billions in lost production, and caused untold personal suffering to individuals and their families. Any sovereign government which has a floating, non-convertible currency has the power to put people to work, despite the ravings of deficit hysterics. As proof, note that the federal government employed one of every three adult males in military service during the Second World War, yet the economy rebounded from the Great Depression and was sufficiently productive to help win the war. Pro-growth policies, not austerity, will rescue the middle class, an understanding that eluded the former finance minister. I think I would have declined the opportunity to comment on Flaherty and his “Legacy”. I mean really the guy was a bully of the poor, the unemployed, the sick, the tired, minorities and the dismantling of the economy in Canada. So I am actually quite sure there is nothing good to say about a man that pulls resources from those that need it- and many of these people undoubtedly were in life or death situations- so ultimately we are taking about responsibility over head counts on people’s life and death. The way you start this article out Armine I am wondering if you were actually serious or were you pulling our legs- a finance minister is not the prime minister so we cannot allocate blame to him- I mean really its like saying Goering was innocent because it was Hitler who told him to do it- guilty is my verdict- all the evidence is right there in recent history under Harris and Harper- you should have declined! Ontarians remember Flaherty well from the Mike Harris regime. He claimed to have balanced the budget, yet, when he, and his party, were soundly trounced, we discovered a hidden massive deficit! In many ways, Ontario has yet to recover from this (and certain parties have been less than helpful). I do not trust his balanced budget and I believe this is a deliberate tactic. By making sure the money is not there, the following government is unable to implement their election promises. They can then campaign on the fact that they kept their promises and get back in sooner. Hi Armine-I was listening to Michal’s podcast this morning with you on it, and I have to admit I was probably a bit hard on you above. Sorry- I think it was listening to all the media praise him that day and it really stuck in my craw for a week that not much was said about all the beatings he has laid on people. He is still a thug as far as I am concerned- but that is Canada and the political elites we are ruled by- everything is just gravy at the top. Anyway it was a good show this morning, and keep bashing by stealth. You’ve got to look deeper than just “full employment by killing Germans.” Not counting soldiers, for whom “unemployment” all too often came in the form of death or disabling injuries, all the people working in the munitions/aircraft/warship etc. factories were working for the owners of those factories who stood to profit mightily both during the war and after. Not so when it comes to recruiting nurses and teachers, I’m afraid. Canada’s corporate media: why was the CBC cheerleading along?